I'm in love with black beans. Love, love them. And here it is much, much cheaper to buy them dried and cook them myself. So when I buy black beans I make the whole bag and then we have black beans for a long, long time. This is not a problem for me or for Canaan, who likes to eat them like raisins. I also love, love mexican food. Especially when I'm pregnant. Mexican food that involves black beans? You just can't go wrong. I also love, love chopping vegetables. One of my favorite kitchen activities. Is that weird? I really like chopping peppers and onions, neither of which I particularly like to eat. But to chop. Yes. I like to. This salad is pretty much like therapy for me I guess. Aside from all those other loves it was pretty dern good to eat. Refreshing, light, but packed with flavors and punch with cilantro cascading over top and bright limes and smoky cumin mixing into each vegetable through the dressing. And for people who care about this kind of stuff, because I know this house definitely doesn't but we have an ever-expanding circle that does, it's a naturally and easy gluten-free meal. Position a rack in the center of the oven and heat the oven to 425ºF. Line a heavy-duty rimmed baking sheet with foil. Cut the peppers in half lengthwise and remove the stem, seed core, and ribs. Put the pepper halves on the baking sheet cut side down. Husk the corn and put the ears on the baking sheet. 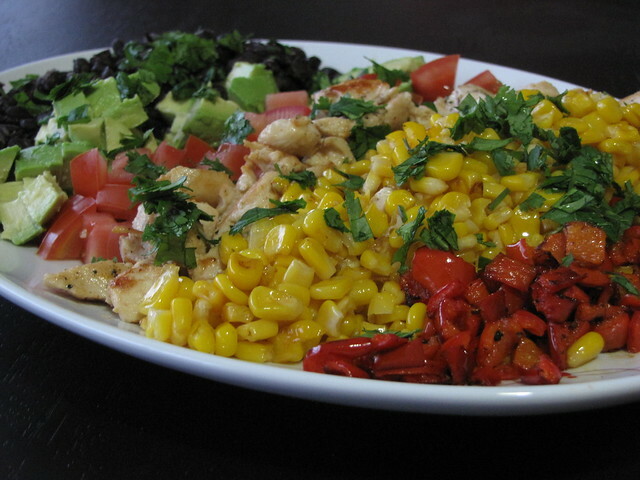 Drizzle the oil over the peppers and corn and rub it around to coat the pepper skins and corn kernels evenly. Sprinkle the corn with salt and pepper. Roast in the oven until the peppers are soft and slightly shriveled and browned and the corn kernels are lightly browned in a few spots, about 20 min. (rotate the corn occasionally as it roasts). When the vegetables are done, let them rest until cool enough to handle. Scrape away the pepper skin and cut the flesh into 1/2-inch dice. Cut the corn kernels from the cob. You should have about 1-1/2 cups kernels. Mince and mash the garlic to a paste with 1/4 tsp. kosher salt. In a medium bowl, whisk the garlic paste with the lime and orange juices, shallot, honey, and toasted ground cumin. Slowly add the oil in a thin stream, whisking until well blended. Season to taste with black pepper and more salt and honey, if you like. 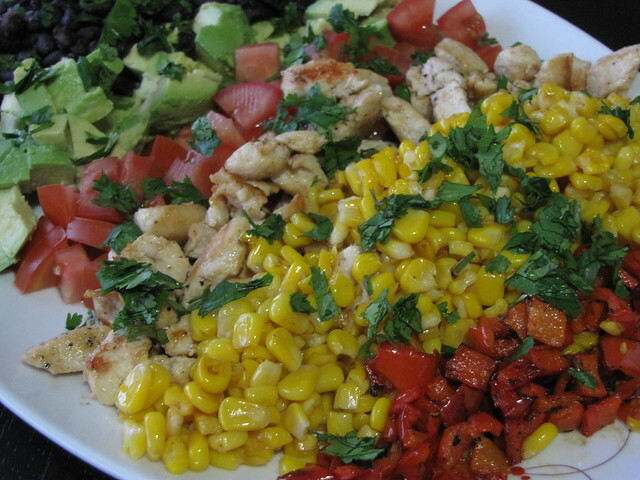 Artfully arrange the corn, tomatoes, peppers, chicken, avocado, and black beans in stripes or piles on a small platter or other wide, shallow serving dish. Sprinkle with the chopped cilantro. Serve the vinaigrette in a pitcher. Encourage guests to spoon elements of the salad onto their plates and drizzle on some of the vinaigrette. Or drizzle the vinaigrette over the salad platter just before serving. That's funny mom. You did tell me and for whatever reason I didn't piece it together as being the same dish. I think maybe because I added chicken and we made it a main dish. You are right Piddy, I didn't even think about all the different allergy groups it could work for. Kora - isn't exciting when you know you can get everything?? It's rare for us to get fresh corn so I snap it up when it comes. And we can't get shallots usually but those are a pretty easy sub! I just made this for the group of HR people from Australia, Canada, England, and Holland. I think I told you about it at the time. Every bite was consumed, and it looked so pretty on my sunny, yellow, square platter. You could chop vegetables for me anytime. It's not my favorite activity in cooking. I love this salad - make it often! Your photo makes it look even more gorgeous! making this soon. we can get everything here- yay!